You hear players and coaches talk about having the Will to Win all the time, but it's rare when you actually see it. If you watched Game 5 of the Eastern Conference Finals you saw it. 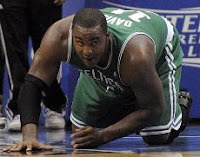 As the Magic's Dwight Howard came down after an offensive move his left elbow plowed into the face of Glen "Big Baby" Davis of the Celtics. After Howard's missed attempt, the Celtics grabbed the rebound and headed down the floor-all except for Big Baby. He fell to the floor after the elbow hit him and laid there for about 3 seconds. Then the Will to Win hit him. Big Baby who had 3 seconds earlier received a concussion from the elbow, tried to get get up off the floor to go help his team, but he couldn't The concussion had affected him so bad, he couldn't even gain his footing for 4-5 steps. Once he did, he was still trying to make it down the floor but was stumbling across the court. I would guess that 99% of all players and people for that matter would have just laid there and waited for help from their coach, trainer, teammates, or parents. We know Big Baby has the Will to Win. The question is...do you?